Q- Hi, Bill, What do you suggest that I can put on the rubber seals on my storage doors to keep them from sticking to the frame? A- Hi Dan, it’s good to hear from you. Try cleaning the seals with Goo-Gone first then wipe with alcohol. Next, soak a rag heavily with silicone spray and wipe all of the seals two times. If the surface of the seals is starting to peel off, this is the sign it will be time to replace them. 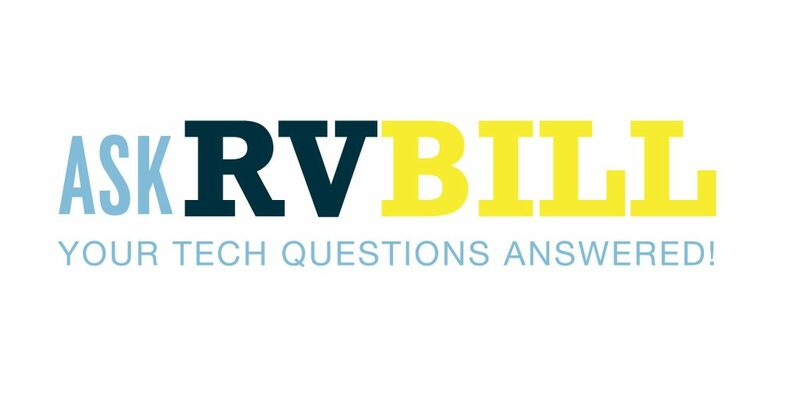 Q: Bill, I set up my calendar to create an automatic recurring note every six months to replace the water filter cartridge on our RV (it is a single Pentair Pentek CFB-PB10). I started to replace it this morning and discovered that the old cartridge looks absolutely new, with no stains or residue of any kind. As I recall, the last time I replaced it, it was obvious this was necessary although it had been significantly longer than six months. Is there any reason not to leave it in place a while longer? I just put it back in the canister since it didn’t look like it needed to be replaced. Can its condition be determined by visual observation or is there any other reason to change it on a regular schedule? I haven’t noticed any decrease in the water pressure. Newmar told me that the filter is ahead of everything, so that all the water goes through it, whether used directly from the incoming hose or from the storage tank. A: Bob, This is a great, insightful question. Your particular filter is a .5 micron modified carbon block filter. It is designed to remove chlorine, taste, and odor as well as a small amount of lead reduction. This design does resist plugging up with debris for a longer filter life. Carbon block filters do a much better job than activated charcoal filters because the water is forced through the carbon instead of around the carbon particles. Under normal conditions, you can run this filter for about 12 months. Unfortunately, you cannot visually determine the condition of the filter as they do filter out chlorine and other particles that can cause a taste and odor problem and they can become less effective in a shorter period of time. You have indicated that your water pressure is still good so it is obviously not plugged up by a large number of particles. If the water still tastes pure and you have good flow, there is no reason why you shouldn’t be able to continue to use it for a few more months. Q– Hey Bill, We met you at the TT preserve in Cottonwood, Arizona. I do have a question about our 2016 Redwood fifth wheel. We have a propane tank on either side of the trailer and it appears that there are two LP gas regulators, one on each side, although one is smaller than the other. The smaller of the two has a small hole in it is slowly leaking propane. I am somewhat handy and have all the necessary tools but I am not sure what that small regulator is called and what I should order. A- The smaller LP regulator that you are mentioning is actually what they call a high-pressure regulator- this helps regulate the pressure for that long run of the LP line from one side of the coach over to the automatic changeover LP regulator. When the diaphragm starts leaking on any type of an LP regulator, it will seep out one of the vent holes. When manufacturers first started installing propane tanks on either side of the trailer, it was soon discovered that the long run of a high-pressure line from one side to the next caused problems with the automatic regulator. There are different pressures on the smaller regulator that you are mentioning. My suggestion is to remove the leaking regulator and take it to an RV parts counter and ask them to order a new one if they don’t have it in stock. Q- Bill, My 2006 Winnebago batteries that reside under the step as you enter the motorhome have been a constant problem with corrosion growing from the terminals. They are roughly about four years old, and they don’t last very long when I’m boondocking. I don’t want to take it into the repair shop every time the corrosion builds up, is there any type of a battery that I can replace my battery is with the do not continually build up corrosion? I would really like a maintenance free battery because it’s not easy for me to get under the step keep adding distilled water. Any suggestions? A- Lori, I understand that it’s kind of a nuisance to have to get under the steps in such a tight area while cleaning the corrosion and adding water to the batteries every month or two. The corrosion is caused by the gassing effect, which is normal with older lead-acid batteries. Your Winnebago motorhome came with a pair of 12 V batteries. My suggestion would be to replace the 2, 12-volt batteries with 2, 6-volt batteries- the Lifeline GPL-4CT would fit in place of your 2, 12 Volt batteries. Your local shop will be able to properly execute this installation, as they need to be wired in series instead of parallel like 12 Volt batteries. Lifeline Batteries are absorbed glass mat and absolutely maintenance free. These fantastic batteries can even be shipped via UPS because they don’t contain any liquid. Shop around on the Internet for the best price. As an added bonus, the two Lifeline Batteries will give you quite a bit more storage when you’re out boondocking. Q- Bill, summer is here and I’m concerned about our 10-year-old Coleman air conditioner. Can you give me a few tips for maintenance and what I need to look for to ensure that we won’t be out camping this summer and wind up without a functioning air-conditioner? A- Brad, Kudos in ahead to ensure that you’ll have a carefree camping trip this summer. Annual service on rooftop a/c units is imperative. Here’s a rundown on servicing your Coleman air conditioner. Start the process by removing and cleaning the return air filter. While the filter and intake grill assembly is off, use a bright flashlight and look up into the air-conditioner and locate the evaporator, be sure that all of the fins are clear of debris and clean. Inspect the wiring to make sure everything is intact. Remove the shroud that covers the upper unit of the air-conditioner. Hopefully, you have access an air compressor- using about 100 psi, blow the dust and debris out of the condenser- these are the fins at the rear of the air-conditioner. Blow out any leaves or debris that may surround the fan and compressor area, and inspect the wiring. Providing there will not be any issues with mechanical failure, your air conditioner should function normally for many hours. Got a question for Bill? Send an email to AskRVBill@equitylifestyle.com!